The 2014 Kentucky Derby is less than a day away and if you plan to bet on Kentucky Derby long shots or longshots, however you want to call it, you should check out our below review of our favorite long shots to win the Kentucky Derby. The most intriguing part of the Kentucky Derby is the fact that so many long shots have won the race. These horses are often the horses we remember the most due to the fact that they were not supposed to win the Kentucky Derby, at least according to the odds makers and general public. In 1953, Dark Star took everyone by surprise by giving Native Dancer his one and only defeat of his career. Dark Star won the Kentucky Derby at 25/1 betting odds. In 1999, Charismatic shocked the world when he went off at 31/1 betting odds. Trainer D. Wayne Lukas seemed as shocked as anyone due to the fact that his other entrant Cat Thief was one of the favorites going into the Derby and many racing analysts simply wrote off Charismatic. You can’t talk about Kentucky Derby long shots without mentioning Giacomo and Mine That Bird who both won their Kentucky Derby championships going off at 50/1 odds which are making for some very interesting Kentucky Derby bets for US players. The ultimate upset was Donerail. In 1913, no one at the track thought that Donerail could win the Kentucky Derby because the betting odds on this horse were a jaw dropping 91/1. 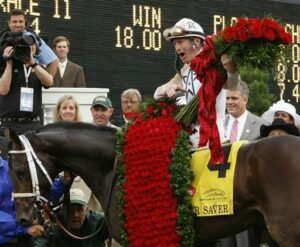 Could a long shot win the 2014 installment of the Kentucky Derby? According to experts, some say that Tapiture, Wildcat Red and Dance with Fate could be long shots that have a legitimate chance at winning the Kentucky Derby. Why not put a $2 wager on one of these horses to win just in case the unthinkable happens?